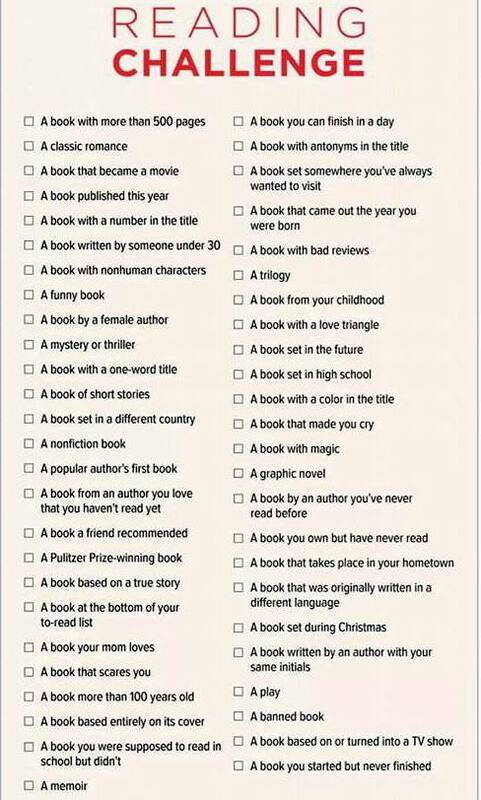 If you’re the Reading Challenge/New Year’s Resolution/long-term goal type, this checklist from Goodwill Librarian is full of good ideas (and a few weird ones. A book with antonyms in the title? Um, OK). I like the idea of consciously diversifying, but I also like to read and reread all the books written by a specific, beloved author in the hopes that s/he will one day come knocking on my door to award me “#1 Fan” status and the accompanying baseball cap. So… dilemma. Anyway, whether your book hobby is broad or narrow, happy reading! Update: If you want to see how my 2014 reads stacked up against this challenge, check out this post from January 2015. I love this list – what great ideas! I reckon I’ve ticked off a fair few of these this year. Ooh what a great list!! Any recommendations for a banned book? Tolstoy’s sweeping masterpiece mirrors Russian society in the Napoleonic Wars. Good thinking — it seemed like an oddly specific thing to include on the checklist, but you obviously found some great options! My favorites are probably Beloved, To Kill a Mockingbird, and Slaughterhouse-Five. Virtually every classic has been banned, though, so you’ll have plenty of options! My friend and I were just talking about this yesterday, specifically that book with antonyms in the title. We thought of War and Peace but don’t know if we could commit because it’s a long classic. (and I just read Les Miserables.) I told her to read The Death and Life of Charlie St. Cloud instead. Haha!